How tweaking your train of thought can help you achieve peak performance. Rounding the end of her race, Kimberly Romanello felt like she didn’t have anything left in the tank. Scene: Her first-ever marathon, kilometre 35, April 17, 2017. Her head hurt. Her feet ached. Sweat pooled down her back, saturating her Multiple Myeloma Research Foundation mesh tank. Gazing into the sign-wielding crowd, her breath laboured, she paused for a moment. “I had a minute there when I was doubting everything and why I had signed up in the first place,” reflects the 30-year-old. “But then, I thought about the pain that my loved ones experienced throughout their battles with MM. 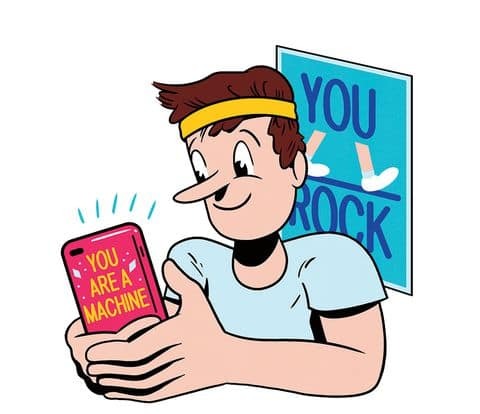 And that’s when my running mantras came into play.” A subset of self-talk, a mantra is a single word or short statement repeated frequently to aid concentration or help accomplish an objective. Romanello’s go-tos are common for runners: a simple “You got this,” or “Run with your heart.” Shutting down her inner uncertainty wasn’t easy, but shifting her focus to these positive statements ultimately helped her finish her first marathon in just under five and a half hours. If that sounds almost too easy, know that there’s plenty of research to back it up. According to a study in Medicine & Science in Sports & Exercise, motivational self-talk can reduce perception of effort and increase endurance, which may lead to a leg up on the competition. In the study, recreational cyclists who learned to use motivational self-talk statements could cycle 18 percent longer than they’d been able to before implementing this strategy. They also had a lower rate of perceived exertion than those who didn’t engage in positive self-talk. Put into running terms: A few happy thoughts could help you push your usual 30-minute run to 35 minutes with ease. Starting to fatigue? Bring your mantras to life by voicing them – even quietly. Trust us, the weird stares are worth it. One study found that basketball players passed the ball faster when they motivated themselves out loud, and that the strategy worked for any task based on speed, strength, or power. Once you settle on what your go-to motivational phrases are, amp up their impact by surrounding yourself with the sayings from morning to night, especially in the weeks and days leading up to a race or competition. Try embedding them in your email signature or on your phone’s home screen. Share them on your social media. 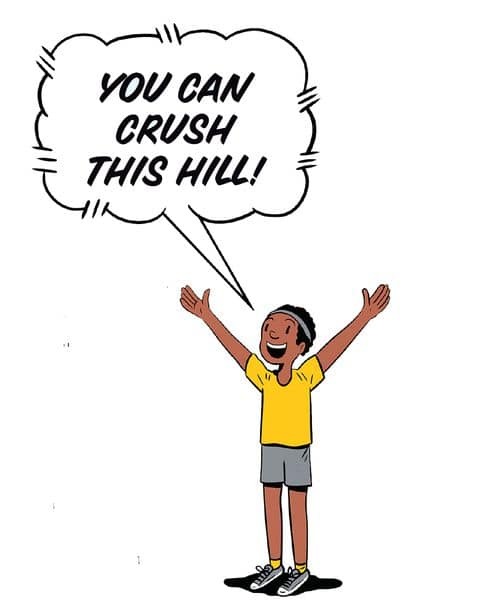 Then, repeat your running mantras to yourself periodically while spending three to five minutes visualising yourself as the runner you want to be. “It’ll help you to reinforce the way you want to think, feel, and run,” Afremow says. We all have a friend who swears like a sailor (and maybe that friend is you). While it’s one thing to use profanity in jest with your buddies, it’s another to make that type of language commonplace in your mantras. Because profanity has a negative connotation, many people don’t react well to that type of degrading talk, Wiersma says. Be aware of how expletives make you feel, especially on repeat. It can be a powerful tactic for some, he adds, but most are better off avoiding obscenities altogether.